We have spent Thanksgiving with the Siemens family for almost every Thanksgiving since Leah and I moved to Anchorage. The first Thanksgiving was spent with our own family, who visited from Iowa (my parents) and Portland (my brother and sister-in-law) for the long weekend. Since then, the Siemens' have welcomed us to join them for the holiday. This year I was asked to bring an appetizer for everyone to enjoy. 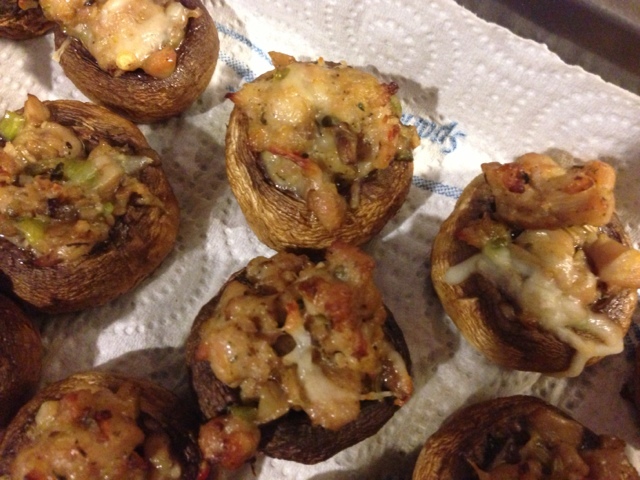 I asked Matt what he wanted and he said stuff mushrooms...so stuffed mushrooms is what I brought. 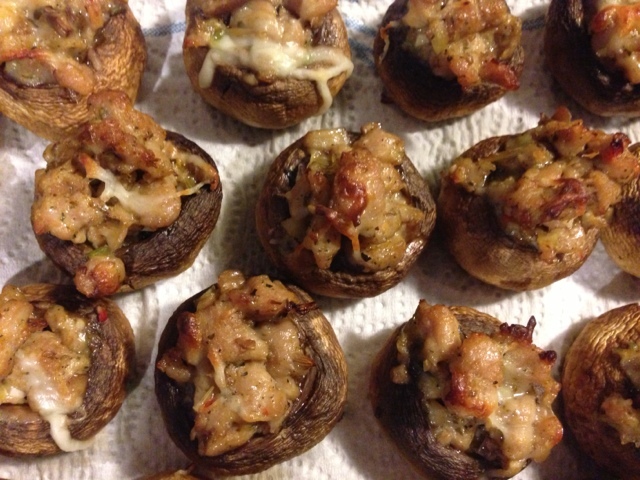 Since I knew we would be likely experiencing a high dose of carbs for the main course, I went for a low carb version of stuffed mushrooms and added some spice to make the mushrooms more satisfying. Heat oven to 400F. Remove stems from mushrooms and chop finely to equal 1/2 cup (save or discard leftover stems). Place mushroom caps in bowl and toss with 1 tbsp oil. Arrange caps, gill side up, on baking sheet. Heat 1 tbsp oil over medium heat in skillet. 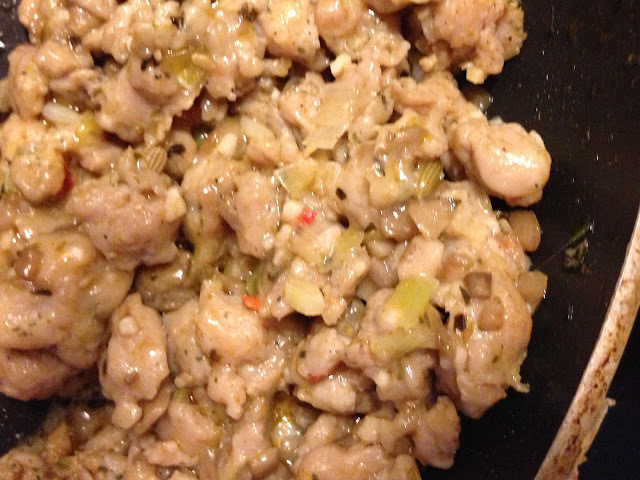 Add sausage, scallions, garlic, seasonings and mushrooms stems. Stir and break sausage into smallest pieces possible until cooked through, about 5 minutes. Remove from heat. Add 1/2 c mozzarella and 2 tbsp parmesan cheese; stir just until cheese melts. Stuff mushroom caps with mixture. Sprinkle with 2 tbsp mozzarella. 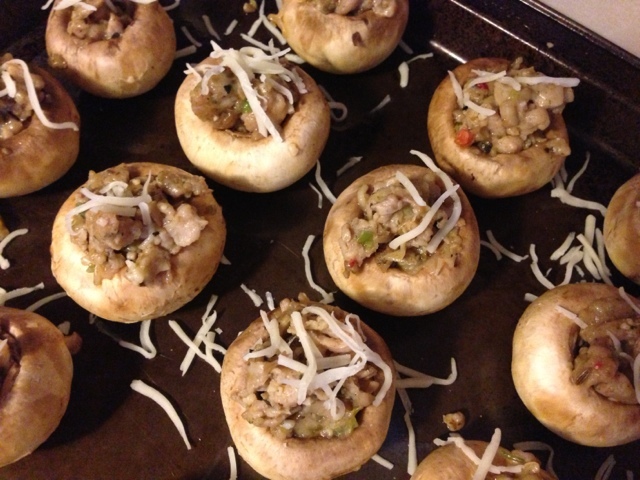 Bake until cheese has melted and mushrooms are tender; about 10-12 minutes. The mushrooms were a hit and Thanksgiving was a wonderful day. Matt and I are truly blessed to have people that care so much about us in Anchorage...where we are so far away from our own families. 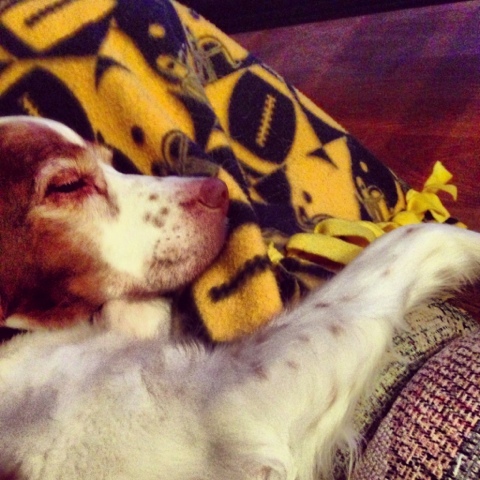 For the rest of the evening, we relaxed and spent some quality time with Rio. I think she was pretty tired because she dosed off pretty quickly. Such a cutie.